...There are three ideas that are central to Rosh Hashanah – kingship, shofar and remembrance. It is the acceptance and internalization of these concepts that will be determinative of our Yom Tov experience. That is what I need to work on. I always tell my students that awareness is half the battle. Just knowing where I need to focus my energies helps shape and give structure to the day – and to my errant, chaotic thoughts. But it’s not enough. I am going to pick one idea in each area to work on. Kingship (malchut) means accepting the Almighty’s absolute authority. Whatever He says, goes. Whether it makes sense to me or not. In fact, if it makes sense to me there is a danger that I am acting in response to my own intellect and reason and not to the Almighty’s command. Once I’ve used my mind to determine there is a God and that He gave us His Torah, then I need to subjugate my will to His. I can deepen my understanding of the mitzvot (commandments) in order to strengthen my observance of them and my connection to God – but not as a way of evaluating their importance or relevance. My intellect and my goals can’t share the monarchy with the Almighty. I am working on recognizing and accepting the fact that my intellect is only a tool in the service of my Creator. The Almighty will redeems us. The messiah will come. There will be a world of clarity and not confusion. This allows us to get up and face each day. The shofar reminds us never to give up, that no matter how bleak it seems, dawn is just around the corner. And finally, remembrance. What does it mean that the Almighty remembers us? Was there a risk He would forget? It means we have a personal relationship with Him; He cares about each of us individually. Kingship can be (should be) a little intimidating. Kingship can be a little distant, a little awe-inspiring! Remembrance is up close and personal. The Almighty cares about me. He’s involved in my life. He’s interested in my good. He loves me more (much more) than I love my children. He wants my good more (much more) that I want their good. And unlike my all-too-human parenting, He’s never too busy for me, He never loses His temper with me and He never makes mistakes. Everything that happens is custom-tailored just for me. Wow! Remembrance (zichronot) is to never forget that the Almighty loves me – imperfect, struggling (one foot forward, two steps back) me. Tip for a meaningful spiritual Rosh Hashanah experience: Concentrate on what you can give to HKB"H instead of what you want to receive from Him. When we open ourselves up to give, something flows out of us and it makes room for what He wants to give to us. It produces a flow and makes us into a vessel to channel it. If we are stuck on getting instead of giving, this creates a blockage which causes stagnation. 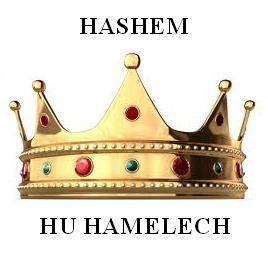 May each of us become a pure and holy veseel for Hashem's love and forgiveness. (From Spaceweather.com) A NIGHT TO REMEMBER: A coronal mass ejection (CME) hit Earth's magnetic field around noon Universal Time on Sept. 26th. The impact set the stage for a night to remember. As soon as darkness fell over Scandinavia, auroras filled the sky with such intensity that they were visible through rain clouds. Fredrik Broms photographed the scene from Kvaløya, Norway. "These were some of the most amazing auroras I have ever seen," says Broms, a longtime observer of the Arctic lights. "The colours were absolutely stunning with purple and deep blood-red in addition to the green. It was a night I will never forget! "when mountains fall into the sea"
"... God is for us a shelter and a strength, a help in troubles; He is very accessible. Therefore we will not fear when the earth changes and when mountains totter into the heart of seas." Santa Cruz de Tenerife - Minor earthquakes have been reported on El Hierro, indicating a slim chance that a volcano could erupt on the Spanish Canary Island, an expert said on Monday. ...More than 30 quakes occurred on Monday. ...The authorities are informing the island's 10 000 residents about the possibility of an eruption and on what to do if that happened. El Hierro has not seen a volcanic eruption since 1793. ...The vast majority of the tremors have been recorded in the northwest of the 278.5-square-kilometre island at El Golfo, the location of a massive landslide that created a 100-metre high tsunami almost 50,000 years ago. ...In a BBC Horizon programme broadcast on October 12, 2000, two geologists (Day and McGuire) hypothesised that during a future eruption, the western flank of the Cumbre Vieja, with a mass of approximately 1.5 x1015 kg, could slide into the ocean. This could then potentially generate a giant wave which they termed a “megatsunami” around 650–900 m high in the region of the islands. The wave would radiate out across the Atlantic and inundate the eastern seaboard of North America including the American, the Caribbean and northern coasts of South America some six to eight hours later. They estimate that the tsunami will have waves possibly 160 ft (49 m) or more high causing massive devastation along the coastlines. Modelling suggests that the tsunami could inundate up to 25 km (16 mi) inland – depending upon topography. G-d forbid it should ever happen! But, if you are located near a coastline where a tsunami could possibly strike, at least know where the highest point in your area is and have a plan to get there fast. Ancient Jewish sources indicate that when prophecy was taken from Israel, it was given to "children and fools." Today, many believe that autistic children are directly connected to Heaven and since the discovery of Facilitated Communication, they have been delivering "Messages from Heaven." Binyamin: "Without Miracles - There's No Chance to Survive"
Binyamin: "The World Can't Continue Like This"
Daniel: "At The Last Moment"
Daniel's Father: "Photographing the Star"
Menachem: "Show Hashem You Are With Him"
Binyamin: "Oy Hashem, Oy Hashem!" Binyamin: "When We Will Begin to See the Star"
Binyamin: "Eretz Yisrael - Noah's Ark"
Daniel: "I Understand That I Was Wrong"
Binyamin: "To See The End of The World"
Binyamin: "Get Up and Go Up to Eretz Yisrael!" Binyamin: "From Sedom Until Jerusalem"
Daniel: "The Prudent At That Time Will Keep Silent"
Binyamin: "The Wickedness Is Conquering The World"
Daniel: "The United States Together with Europe - Will Disappear"
Menachem: "The War in Heaven Already Started"
Binyamin: "The World is on the Way to War"
Menachem: "To the Lowest Degree"
Binyamin: "Everything is Falling Apart"
Binyamin: "Under the Gentiles' Rule"
Binyamin: "Hashem is With Me, I Have No Fear"
Menachem: "Go Up to the Island and Don't Come Down"
Binyamin: "Don't Let Go of the Rope"
Binyamin: "And If the Jews Won't Understand the Message..."
Binyamin: "They Are Worse Than Animals"
Menachem: "We're Entering Into the Darkness"
Message from Binyamin: "The Last Crusade"
Binyamin: "The State of Israel - It's Not a Jewish State"
Message from Daniel: "This Time It's For Real"
Message from Binyamin:"And planted eternal life within us"
Message from Daniel: "NO FURTHER": (Pt 1) "Today We Are Like in Egypt"
Message from Daniel: "NO FURTHER": (Pt 2) "They Will Die Just from Fear"
Message from Menachem: "If there's no geulah - there's no next generation"
Message from Binyamin Golden: "Go Into the Ghettos"
Binyamin - "Sheker Rules the World"
"Why are the Righteous Being Taken Away?" Message #2 - "The Last Days of this World"
Message #3 - "There's nowhere to run"
Message # 3 - Q and A Message #4 - "The Last Days of This World"
"Return to Me and I will return to you." 1. Sound a shophar in Zion and sound an alarm in My holy mountain; all the inhabitants of the land shall quake, for the day of the Lord has come, for it is near. 2. A day of darkness and gloom, a day of cloud and thick darkness, like the dawn spread over the mountains; a numerous and mighty people, the like of which has never been, and after it there shall be no more until the years of the generations. 3. Fire consumes before it and a flame blazes after it; before it, the land was like the Garden of Eden, and in its wake is a desert wasteland; neither does it have a remnant. 4. Like the appearance of horses is its appearance, and like horsemen, so do they run. 5. Like the sound of chariots on the mountaintops, they leap, like the sound of a flame of fire consuming stubble, like a mighty people arrayed for battle. 6. Peoples quake from before it; all faces gather blackness. 7. Like mighty men they run, like men of war they scale the wall; each one goes in his ways, and they do not make their ways crooked. 8. And no one pushes his neighbor, each one goes in his path. They rest upon the swords and do not receive monetary gain. 9. In the city they clatter; they run on the wall; they go up into the houses; through the windows they come like a thief. 10. Before it the earth quakes, the heavens tremble; the sun and moon darken, and the stars withdraw their shining. 11. And the Lord gave forth His voice before His army, for His camp is great, for he who performs His word is mighty, for the day of the Lord is great and very awesome; who can abide it? 12. And even now, says the Lord, return to Me with all your heart, and with fasting and with weeping and with lamentation. 13. And rend your hearts and not your garments, and return to the Lord your God, for He is gracious and merciful, slow to anger, and of great kindness, and He repents of the evil. 14. Whoever knows shall repent and regret, and it shall leave after it a blessing, a meal offering and a libation to the Lord your God. 15. Sound a shophar in Zion; proclaim a fast, call an assembly. 16. Gather the people, prepare the congregation, assemble the elders, gather the infants and thesucklings; let a bridegroom come out of his chamber and a bride from her canopy. 17. Between the porch and the altar let the priests, the ministers of the Lord, weep, and let them say, "O Lord, have pity on Your people, and do not make Your heritage a derision, for nations to make them an example. Why should they say among the peoples, 'Where is their God?' "
18. And the Lord was zealous for His land, and He pitied His people. 19. And the Lord replied and said to His people: Behold I send you the corn, the must, and the oil, and you shall be sated by it, and I will no longer make you a derision among the nations. 20. And the northerner I will distance from you, and I will drive him to a land barren and desolate; its face to the eastern sea and its end to the western sea, and its stench shall ascend and its ill savor shall ascend, for it did great things. 21. Have no fear, O land; rejoice and jubilate, for the Lord has performed great things. 22. Fear not, O beasts of the field, for the dwelling places of the wilderness have become covered with grass, for the trees have borne their fruit, the fig tree and the vine have given forth their strength. 23. And the children of Zion, rejoice and jubilate with the Lord your God, for He gave you the teacher for justification, and He brought down for you rain, the early rain and the late rain in the first month. 24. And the granaries shall be filled with grain, and the vats shall roar with must and oil. 25. And I will repay you for the years that the increasing locust, the nibbling locust, the finishing locust, and the shearing locust have devoured-My great army, which I have sent against you. 26. And you shall eat, eating and being sated, and you shall praise the Name of the Lord your God, Who has performed wonders with you, and My people shall never be ashamed. 27. And you shall know that I am in the midst of Israel, and I am the Lord your God, there is no other; and My people shall never be ashamed. Raining on the Palestinians' "Parade"
Maybe it will dampen their enthusiasm for "celebrating" statehood. Rain fell in Tel Aviv late Friday morning as well as in other areas of central and northern Israel, including Haifa and the western Galilee. The rain was forecast to spread to the South, and continue until Sunday. 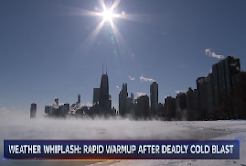 A drop in temperatures, as well as storms, was also expected. In August, light rain fell in Tel Aviv and other areas of central Israel which marked the first time that rain had fallen in Israel during the current summer, a rare occurrence that does not repeat itself on a yearly basis. ...The spending bill is needed to keep the government running through Nov. 18; current spending authority stops at the end of September. House Speaker John A. Boehner (R-Ohio) had hoped to avoid another budget battle in the wake of the summer's debt ceiling fight and a near-shutdown of the government in April that caused voters to sour on Republicans and Democrats in Congress. The rebuke gives new currency to Senate Democrats' efforts to fund disaster aid without cuts elsewhere. Congress has just days to resolve the impasse as lawmakers are expected to recess Friday for the Jewish holiday of Rosh Hashana next week. ...After a year of floods, tornadoes and recent hurricanes and wildfires, the Federal Emergency Management Agency's disaster fund is about to run out — as soon as Monday. Already, FEMA has prioritized its remaining resources to provide immediate food, water and debris removal for recent disasters, while longer-term building projects are on hold. In six days, it will be Rosh Hashanah 5772. On Rosh Hashanah, the whole world stands in judgment for the coming year. On Rosh Hashanah, both the totally righteous and the totally wicked receive their judgments. The rest of us, who can potentially go either way, the beinonim or "the ones in the middle," have the ten days between Rosh Hashanah and Yom Kippur to convince the Creator, Master and Judge of the World why He should let us live for another year. On Yom Kippur, the verdict is rendered and on Hoshanah Rabbah, the last day of Sukkot, it is sealed and sent. Rosh Hashanah focuses on our repentance, on the need to change our evil ways, to turn around and go in the other direction. When it all comes down to it. It's all about which direction you are headed. No matter where you are on the path, are you moving toward Hashem or away from Him? Today, Mahmood Abbas, head of the Palestinian Authority, is scheduled to make an appeal for recognition of an independent Palestinian state at the UN. Both he and Bibi Netanyahu are scheduled to address the world body on Friday afternoon, NY time. Today, a spent satellite is headed for a crash landing somewhere on Planet Earth. Today, Comet Elenin should become visible again, if it didn't disintegrate after its closest approach to the Sun. What will be? 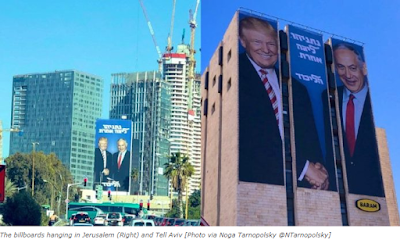 Well, since it all is supposed to take place after 6 pm Israel time, which is candlelighting in Jerusalem, I guess I'll be in the dark about it all until at least 25 hours later. Shabbat shalom! And Happy Birthday to the World!! Shabbat, 25 Elul, is the anniversary of the First Day of Creation. (Tehillim 19.2) "The heavens recite the glory of God, and the sky tells of the work of His hands." MAJOR X-FLARE + CME UPDATE: Earth-orbiting satellites have detected a long-duration X1.4-class solar flare coming from a new sunspot on the sun's eastern limb. The blast, which peaked at 1100 UT, produced a significant coronal mass ejection (CME). Using data from the SOHO-STEREO fleet of spacecraft, analysts at the Goddard Space Weather Lab have modeled the trajectory of the CME and concluded that the body of the cloud will not hit Earth. A minor glancing encounter with the outskirts of the CME is, however, possible on Sept. 25th. ...Note how the underbelly of the space station glows green from the reflected light of the auroras below. Also, in the distance, Sirius the dog star and Orion the Hunter can be seen rising feet-first into the night sky. The storm, which registered a moderate 6 on the 0-to-9 K-index scale of geomagnetic disturbances, was caused by a coronal mass ejection (CME) hitting Earth's magnetic field. It was just a glancing blow, but with CMEs that is often enough to spark bright auroras over both ends of Earth. The space station was flying over the southern hemisphere at the time of the display. Observers in the northern hemisphere saw it too. ...This increased activity arrives as scientists announce that the Solar Dynamics Observatory (SDO) has spotted a new pattern in solar flares in the last 15 months. ..."We're starting to see all sorts of new things," said SDO scientist Phil Chamberlin at NASA's Goddard Space Flight Center in a press release. "We see a large increase in emissions a half-hour to several hours later, that is sometimes even larger than the original, traditional phases of the flare. "In one case on November 3, 2010, measuring only the effects of the main flare would mean underestimating the amount of energy shooting into Earth's atmosphere by 70 percent." I will begin with a hard sentence: In the near future there will be a war. A war in all the Middle East. And then, they will forget all of the nonsense in the heart, in the thoughts, and in the deeds. And this war will draw in more countries, until it will truly be the BIG war. Not Gog uMagog, but the BIG war like what we call "World War 3." And the last clarifications will then be: Who is on the side of truth and who is not. And it's a lot closer than you dream. And what has happened and is happening this week, that is what the future will be based on. The coming times will be much harder that it was until now. But, don't despair, continue on, no matter what. And if it's hard now to be modest and close to the truth and to HKB"H, in the very near future, you will notice that it will begin to be still harder than it is now. But, together with this, you will see many women who will decide to sacrifice themselves for the sake of Heaven and will begin to dress themselves in much modesty. And this will annoy the Mitnagdim (those who oppose them). And then, there will be the BIG war. And the mitnagdim who are not Jews who stood at Har Sinai: "They will receive the award." And then, also, the Zionists will fall further. I don't know what else to say. Today is the end of the evildoers. They have a feeling that they are disappearing, that these days are their last and therefore, they are even more evil. [Daniel 12:10 - "...the wicked will act wickedly, and none of the wicked will understand; but the wise will understand."] And this feeling, it's not conscious, but sub-conscious. Look, the Jews that came out of Egypt came out with much silver and gold, but, it's impossible that they had materialism, because they did not have food and water. So, what is materialism? The gold we cannot eat. And if there isn't food, there isn't life. And if there isn't life, there is no materialism. Q. Why do we feel a 'heaviness'? A. Now, we are heavy because already there is a war. The war began in Heaven as well as here. [See Daniel, chapter 2: "At that time Michael will stand, the great prince, etc."] And you are fighting this war daily. You are on the battlefield and many other Jews are fighting on several issues in Yiddishkeit, but the holiness is the issue. [See 'קול דממה דקה', Vol 38, and others] And it's also pertinent to a person's mouth, to speech. "...As for the second Geulah (in the time of Mashiach Ben David), the Gaon, along with other master mekubalim, asserted that there will be great wars, both in the physical and metaphysical planes between the Jews and other nations, as well as internally between Jews and "Jews" who are part of the Erev Rav (the "Mixed Multitude")." There has been talk in the blogosphere about the advisability of praying for a delay in the Redemption in order to give some people more time to do teshuva. It bothered me when I first read it and it's still bothering me, so I've decided to share my thoughts on the subject. "Behold our affliction, take up our grievance, and redeem us speedily for Your name's sake...."
"...may all wickedness perish in an instant, and may all Your enemies be cut down speedily. may You speedily uproot, smash, cast down, and humble wanton sinners - speedily in our days...."
"And to Jerusalem, Your city, may You return in compassion, and may You rest within it, as You have spoken. May You rebuild it soon in our days as an eternal structure, and may You speedily establish the throne of David within it...."
"The offspring of Your servant David may You speedily cause to flourish,...."
After petitioning the King for a "speedy" redemption, how are we then to say at the end that we didn't really mean it? We'd really like to have a "delay." Even if it's for a "good" reason like giving people more time for teshuva, it sounds absurd and I can't imagine how it would be received in Shamayim. And for another thing, my experience tells me that the more time that goes by, the more people are falling off the derech and letting go of the "rope," rather than the other way around. Surely, the Men of the Great Assembly who composed our daily prayers and who included among them the last of the Hebrew prophets - surely, they knew what we would need most at the end of our long, hard exile - a speedy redemption! Hashem, save us NOW! because we don't have the strength to go on anymore!! 8. [c] [Isa. 60:22] "in its time, I will hasten it." Our Sages interpreted this principle to mean that, if they [the People of Israel] merit it, I will hasten it [the Redemption]; if not, I will bring it in its own time (Sanhedrin 98a). Regarding this, the Gaon commented that after all, the verse should be interpreted literally. According to the plain interpretation, even if the Redemption comes at its proper time, I will hasten it. ...This is also the meaning of "and the things that are to come upon them, will make haste" (Deut. 32). ...Many times I have witnessed the Gaon pacing around his room, speaking agitatedly, saying, "Lord of the Universe, don't you have a middle road between 'its time' and 'I will hasten it.' We insist on the plain interpretation of Your promise: "I am the Lord; in its time, I will hasten it." I want to say to Am Yisrael that the time is very short and if we said it fifteen years ago, now it's really very short, very, very. And I believe that every person, Jew and gentile, feels already that we are coming to the end of this world as we know it. [Ezekiel 7:2 - "As for you, son of man, so said the Lord God: 'To the soil of Israel, an end! The end has come upon the four corners of the land.'"] Also, many gentiles are talking about it - about the end of the world. Very many gentiles believe that we don't have more than a year or a year and a half (Dec 2012). And I'm telling you that I feel that it's a whole lot less than a year or a year and a half. It's so interesting that the gentiles talk about this so much and the Jews - relatively little. Finished. Finished is the materialism that was spilled from every direction, the huge waste of a drunken people with a ravenous craving for all the materialistic things that were ours in times past in such abundance that there was nothing like it in all of history. We have turned into drunkards. [Isaiah 28:1,7 - "Woe is to the crown of the pride of the drunkards of Ephraim ...the position of his glory, which is at the end of a valley of fatness, crushed by wine. ...These, too, erred because of wine and strayed because of strong wine; priest and prophet erred because of strong wine, they became corrupt because of wine; they went astray because of strong wine,..."] Drunkards who behave like drunkards, who disgust the powers of holiness, and who descend so low until it's hard to believe it's even possible to save them. But, nevertheless, the end will come. The Jews, Am Yisrael, Bnei Yisrael that HKB"H so loves, [Avot, Perek 3, Mishnah 3 - "Yisrael is beloved...great affection..."] that He created them especially [Isaiah 43:21 - "This people I formed for Myself; they shall recite My praise."] His dear son! [Jeremiah 31:19 - "Is Ephraim a son who is dear to Me? Is he a child who is dandled? ...My very innards are agitated for him; I will surely have compassion on him," says the Lord."] He will not leave you! He will bring you from every corner of the world, and if you are far from Him in heart and mind, He will drag you with strength and you will suffer very much, but in the end you will come to the truth and will be saved, but it will be very hard. And those who hold on all the time in faith and trust in Hashem and don't fall, even if they laugh at you and say shameful words to you and spit upon you because of your sacrifice for truth, you will be superior to them - those who arrive at the redemption much more complete and you will be those who enter first into the Beit Hamikdash. I know that we wrote, not just once, similar words, but now, the time has come. And it's not just the autistics saying it, also many rabbis are saying it. Not so well-known rabbis, perhaps, and there are many more Sefaradi rabbis who are speaking about these things than Ashkenazi, but, it's the truth. And all the difficult things that we said are about to be, truly will be. And if you think that because the dollar goes up a bit or goes down a lot, goes up a bit more and goes down a lot more, it says that the dollar will continue to go up and that you will be able to continue to make festivities with the money that you earn, sometimes honestly and sometimes fraudulently, then I say to you that it already won't go. It's finished and if you think that one day the stock market will go up high-high and the second day it will go down low-low and on the third day, another time low and the fourth day go up beautifully, then we can already return to all our nonsense and relax in the illusion that the material world, the world of the Golden Calf, the great lie, that it is continuing and we can still live in quiet "as if in the world of HKB"H" - in the world of our falsehood!? No! It's finished! It's completely finished. But, you will get a few more hits and additional examples in order to demonstrate to you who is 'Boss,' and who created the world, and who is the Master of the world, in order that we will understand that man is nothing, not even like a fly, Much less than a fly. And the Golden Calf will disappear with all the toys, with all the materialism. It won't only disappear, it will burn, it will fall. It will look like the Twin Towers after they fell. [Isaiah 40:15 - "...behold the islands are like fine [dust] that blows away.] [And see Isaiah, chapter 2, verses 12-22 the whole matter there at length]. Am Yisrael! We should have a good year, and a good sealing, and we should merit to receive in the near future, Mashiach Tzidkeinu, complete in our spirits and in our bodies. I want to speak and I want to tell that in the near future, the world will change very much. Very much. In the past two years, all the time, the world was descending slowly, slowly towards the abyss. It descends and then like, stops and descends and like, stops. In all areas, in all directions. The direction - it's down. But, in the near future, there will be another very difficult descent, similar to a very tall "roller-coaster." We will go down a descent in a roller-coaster called Olam Hazeh. We will go down the most difficult descent. But, only those who are close to HKB"H will come back up and the remainder will go to the abyss. And again, I want to say that we, Am Yisrael - we are the center of the Creation. ["B'reishit - for the sake of Israel who is called 'reishit.' " Rashi] We - the closest to HKB"H, the dear son of HKB"H. [Isaiah 5:7 - "For the vineyard of the Lord of Hosts is the House of Israel, and the people of Judah are the plant of His joy;...."] We have to be holy. And whoever is holy and whoever will be close to Hashem and will be one who tries only to do the will of Hashem - he will continue to be the center of the Creation. He will go and will develop. Before, in days of Mashiach and afterwards, he will ascend more and more in an ascent that we cannot understand right now. But, the whole world, the vast majority of the nations and the great majority of the Jews, don't want to understand. Don't want to love Hashem. Don't want to come close to Hashem or to do His will. They want only the Golden Calf with all the toys, with all the immorality, with all the immodest things, with all the lusts, all the most forbidden things. And they want to dress it up in righteous clothing and to do what they want. And this - in all areas, in all areas. Look at what is happening in the world! Look, look! You don't see!? You don't understand!? You don't feel it!? Are you thick-headed!? What is it with you!? What is with you!? Are you so, so far away!? 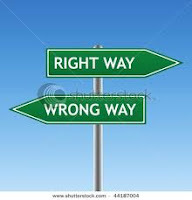 When a person walks in the street, sees the rudeness that is on the chareidi street and doesn't understand that something is very sick within our community, doesn't see the shops that are only an imitation of the gentiles, the dress which is only an imitation of the gentiles, the involvement with nonsense... You don't see it!? You don't feel it!? I beg of you: my heart is broken, Am Yisrael! Am Yisrael! You don't understand!? Start going in the right direction! In a little bit, you will receive another large and severe warning, abroad as well as in Israel. And I hope that you will understand the hints. To the Jews abroad, you are more asleep than the Israelis, but you got a little shove. Hashem grabbed the land and shoved it. He's shoving you. Really. He inserted fear and you ran to the street from fear. But, the fear disappeared, because suddenly, everything got quiet again. But, this fear - it was in order to say to you that one day - Hashem will move you strongly and if you won't be together with HKB"H - you won't come out of it alive. Hashem is threatening you. Like at Har Sinai when He held the mountain over our heads, but this time He won't do that. He will give to everyone a free choice, in order to decide where, where he wants to be. Everyone will have to decide for himself what he wants. And a majority of the Jews are Erev Rav, therefore, this will be a private decision only of the Jews themselves. Because Erev Rav don't have any decision. They are not able to walk together with HKB"H. They can only be with the Golden Calf. But, true Jews are only able to be with HKB"H and even when it appears that they have free will, in truth, they don't have. HKB"H will take them, will drag them, so to speak, to the truth, whether they want it or not. End. I'd just like to comment that this sounds very contradictory, but in reality, it's not. So-called "free" will is not unlimited. As I understand it, certain choices were already made before we came into this world. As a member of Klal Yisrael, we have no choice about our final destiny. Our "free will" only determines whether we will arrive at it by the quick and easy path or the long, hard route. That is our choice. And this is the choice which the autistic child is speaking of. Either we do teshuva on our own and make it easy on ourselves and earn reward for it or Hashem will force us to do teshuva which will be hard and painful and we will lose any reward we might have gained from coming on our own. And those who come the hard way will have many, many regrets. There are black clouds on the horizon. The sky became black and the deep darkness is pouring down upon the face of the whole planet. (Isaiah 60:2 - "For behold, darkness shall cover the earth, and a gross darkness the kingdoms,....") The world is waiting for the end. And the spiritual and material darkness has already arrived upon us, to people in every place in the world. The sensitive among us and those closer to the truth are already able to feel the darkness, the black that is everywhere, the depression, the fear. But, the majority of Jews and gentiles have more bogus happiness and they continue with the music, and the dancing, and the stupidity, a life of emptiness and materialism. But, the end is very near and we have no time. We don't have much time to save ourselves. At the moment that the great war begins in earnest, it won't be possible to return in teshuva, because the confusion will be so great that even if a person wants to return in teshuva - he won't be able to. His mind won't work, the heart will turn to stone and he will die. Therefore, the teshuva needs to be before this. Not necessarily "before," because the first shooting has already begun, but when the stage of all the world burning will arrive, then it's already the end of the teshuva for This World. One thing I want you to understand: There are a few Jews who are on the way to the truth. Like we said, there are Jews that it takes them time to arrive at the truth, but if they stood at Har Sinai, Hashem will compel them to return in teshuva. But a situation is already enlarging in which each Jew is in isolation. And even if he finds a group that is like him, he is isolated. Even if he has a rabbi - he feels himself isolated, alone. But, with Hakadosh Baruch Hu - he feels close. That is to say, that because of all kinds of reasons - the man is not able to establish a relationship with another person to the end, not even with his rabbi. He will need only a direct relationship with HKB"H. And only by way of a direct relationship with his Creator will he be saved. It's worth it to you and to everyone to quickly develop this relationship through the end, or as much as you can. Because this is the single relationship in the world. And it's the single truth in the world. People feel that they are finding truth in all kinds of situations, in all kinds of relationships, in all kinds of theories. But, truthfully - there is only one truth, and it is: The relationship with HKB"H. And HKB"H is the truth - and there is nothing else besides Him. Q. If at the end, there is already no possibility to return in teshuva, then how do we say that Hashem will return every true Jew to the truth in the end? A. I said, after a certain point. Hashem will return all of those who need to return. He will compel them to return in teshuva, no matter what. Like a man that they overpower and take him to a hospital despite his will, and he resists treatment, they coerce him to receive the medications. He shouts and screams and he refuses and resists, he doesn't want it. But, in the end, he receives treatment, and in the end he recovers. Also with these, He will compel them to treturn in teshuva despite that they are stiff-necked. And it's not so simple. There are true Jews who are so broken and so distant, that with all the suffering, in the end Hashem will join a special operation for the sake of changing the head, and will open eyes and the heart and the brain to the truth. Since Adam HaRishon we have a choice, but in practice - it's not a regular choice that we have the possibility to choose if we will go with the truth or not. Hashem directs us and worries that the sparks, the souls that He creates will arrive as designated, as He desires. In actuality, the First Man and his wife had to go through the Great Fall. Because thus the world needed in order to pass through all the stages until the redemption, and to transfer to the redemption. It's hard to explain to logical people, but as you were saying - in the heart you feel it. We're seeing more and more that we have a war on the horizon. Hashem should help us and save us. And after Rosh Hashana there will be amazing situations. As the US steps up its effort to prevent a Palestinian unilateral bid to declare statehood, Israeli officials fear a new eastern front in the form of Jordan. State officials warn that Jordan is in an extremely precarious state and effectively "hanging by a thread." Three days ago, in the post, Geula Process Progressing, it was implied that the break in Israeli relations with its foremost allies in the region, Egypt and Turkey, is a positive sign on the Geula front. According to Rav Yehuda's sources, one might say that Jordan signed it's "death" warrant when it signed a peace treaty with Israel, because before the Light of Redemption (אור חדש על ציון תאיר) can shine, all Israel's ties to any other nation must be broken. "May You shine a new light on Tzion, and may we all speedily merit its light" - We say it every day in the recitation of the blessings before the Shema. According to the Ya'avetz: "A new light. The 'new' light is actually a return to the original brilliance of creation. That light was concealed for the enjoyment of the righteous in the Messianic era. May it soon shine upon Zion." According to Rav Yehuda, this issue is addressed by Rav Yaakov Moshe Charlap, ztz"l who was a close disciple of Rav Avraham HaCohen Kook, ztz"l and a former Rosh Yeshiva of Mercaz HaRav. 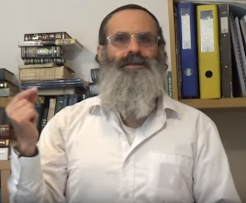 The "Ohr Chadash" cannot be revealed as long as we have any connection to any of the nations. "Not for naught did the head of the Jewish Agency make the recent claim that never before in the history of the state, from 1948 until now, have we stood so alone in the world. This by itself has a silver lining to it, as it brings the footsteps of Mashiach that much closer. The final redemption is too great to be brought about through other nations, wrote Rav Yaakov Moshe Charlap, zt"l, the late rosh yeshiva of Yeshiva Mercaz HaRav (in his monumental work Ohr HaTehiyah). That is why after Pharaoh had given Bnei Yisrael permission to leave, he had to change his mind. The same will be true of the final redemption. The nations of the world will control Eretz Yisrael and will give us the right to settle there. Before the redemption can be complete, however, they will have to regret their decision, so that it will be clear that Hashem alone has redeemed us." Rav Yehuda said that this is also something which was emphasized very strongly by Rav Meir Kahane, ztz"l, Hy"d in his final shiurim at the Ohr HaRa'ayon Yeshiva. I hope to be able to bring you the sources soon. Meantime, don't sweat the little details. Focus on the big picture. This is good news! We are destined to conquer all of Biblical Eretz Yisrael. (Isaiah 11:14) And they shall fly of one accord against the Philistines in the west, together they shall plunder the children of the East; upon Edom and Moab shall they stretch forth their hand, and the children of Ammon shall obey them. I believe this describes the re-taking of Gaza ("Philistines in the west") and the areas of the PA in the "West Bank," which is east of Yerushalayim, ("the children of the East") and extending into Jordan ("Edom...Moab...Ammon"), as it is destabilized by its 75% "Palestinian" population. And it could all happen starting next week with the Sep 20th declaration at the UN! Mashiach is right at the door!! Tomorrow (Wednesday, 15 Elul) will be a special day for the Mizrachi family, not just celebrating a bar mitzvah, but four of them. Brothers Bentzion, Yishai, Yosef and Shlomo will mark the day. For the parents, they will reflect back 13 years after the quadruplets were born to them following three regular births. The proud mother, Yael, recalls that at the time, the doctors recommended killing off some of the fetuses due to the risk, but she of course would not hear of it. She consulted with rabbonim nonetheless, fearing the situation following the doctor’s ominous prediction, and the decision was made to go full term with all four. After a pregnancy accompanied by a long period of bed rest, the four were brought into the world after 35 weeks, with an average weight of 2kg (4.4 LBS). After the quadruplets there was as set of twins, which Yael says “was like winning the lottery twice!” Baruch Hashem, today, the family consists of 11 children Blei Ayin Hora. “They grew up understanding to stand by one another when they need arose, to give in to one another, and most of all, to wait on line; for bottles, food, and a kiss from mom”. Nevertheless explains Yael, there is more than enough love to go around. There will be one grand bar mitzvah, which Yael explains is a military operation. Each will have a table for his own friends, and each will have the spotlight and receive the attention deserved for such an event. Yael explains the family has set up a command center and everyone has responsibilities. She adds the boys are truly unique, with one exhibiting special talents in singing, another being an extraordinary writer and the others have their special abilities as well. The residents of the community affiliated with the Shas tzibur are planning a major event, including some special guests such as families Yosef, Yishai, Atias and Edri. Mazel Tov! MAZAL TOV FROM/TO THE WHOLE FAMILY - KLAL YISRAEL!! And you thought "Katia" was history? The Fall of America's "Sar"
Message # 4 - "The Last Days of This World"
The sins are piling up - Where is the teshuva?